Uglyworld #1786 - Xmas Cards From Internets Land - (Project TW - Image 362-366), a photo by www.bazpics.com on Flickr. Earliers on in Decembers me and Babo makereds up and sendereds a piler of xmas carders to our friendlies that lives in internets land, and we were overs the moon to gets some back from our friendlies too. Our gooders buddy Sidd sendereds us a super coolers card with a ginger breaders houser with giants chocolate covereds cookies for the pathways! 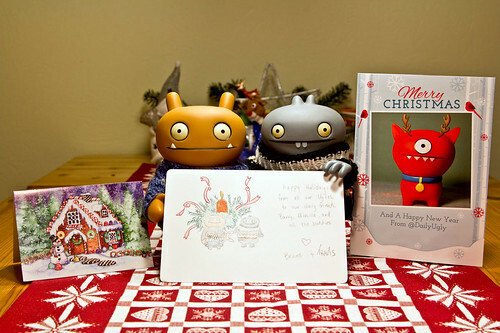 Uglydog posereds with his xmasers antlers on for our card from Charlottes, and Brandi drawereds a mega super awesomers version of a photo of me and Babo when we was makerings the tablers decomarations for the cookie cave! Thanks you all very muchers for senderings us cards, we senders Doug down to the postsboxer every singles morning to checks if any more has arrivereds, but he sometimes gets distractereds by the postswoman, who normally enders up getting chasereds up the street by Doug!